the bigger the cage the happier your joeys will be. Cages should have at least one water bottle and check this daily to make sure it doesn't get sticky and block. Water should be changed at least every second day. They will need at least one fleece cage pouch, but I do recommend having at least one spare for wash day. They should also have fleece vines, fleece ropes, fleece bridges and fleece play triangles for play. Stitching on fleece should be hidden so that their little nails do not get caught. 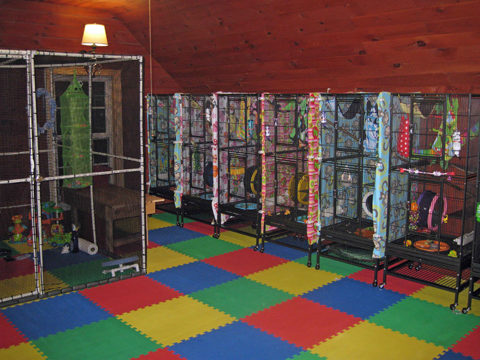 Toys for sugar gliders are very easy, regular baby toys work very well, things you can hang and things made from plastic, which makes them very easy to clean. They love rubber duckies, weebles, baby stimulating rattle style toys, plastic chains, plastic wiffle balls with straws sticking through them. Do not put anything in the cage with rope or loose stitching and avoid cotton and other fabrics that can fray. A sugar gliders nails are very small and delicate and easily catch on these items and they can lose a toe or even a foot. Eucalyptus branches and leaves are safe for sugar gliders and a great way to encourage natural behaviors and keep nails trim. Nails should be trimmed every few weeks. NH Sugar Gliders provides Nail Clipping Service for $10 per sugar glider and can teach you how to do it yourself. 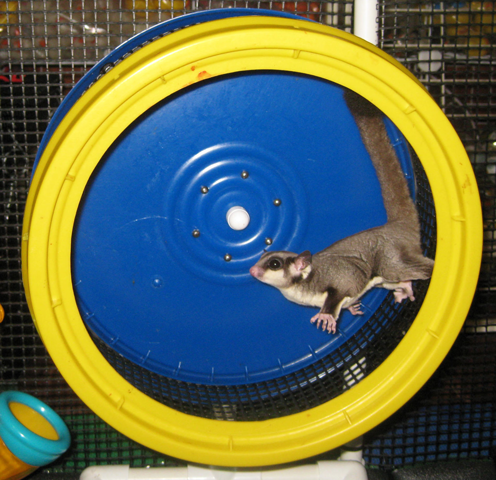 Sugar Gliders should always have a glider safe wheel in their cage, they require this for exercise, however the pet store wheels are not safe and they will need either a fast track wheel or similar. You can order these through NH Sugar Gliders for $45 and they will take approximately 1-2 weeks to arrive and are available in different colors including, red, blue, yellow, green, black, pink and purple. Nail trimming kits for wheels also available for $8.